Note: This review contains a few hints at what goes on in this movie and if you have any interest in seeing this film, you should probably watch the film first for the best experience. As I will explain in my review, this is an incredible movie and you should go see it if you can. The first shots in The Hateful Eight are of quiet, snowy scenery. This isn’t the last gorgeous shot in the film, but don’t let the beautiful cinematography fool you. 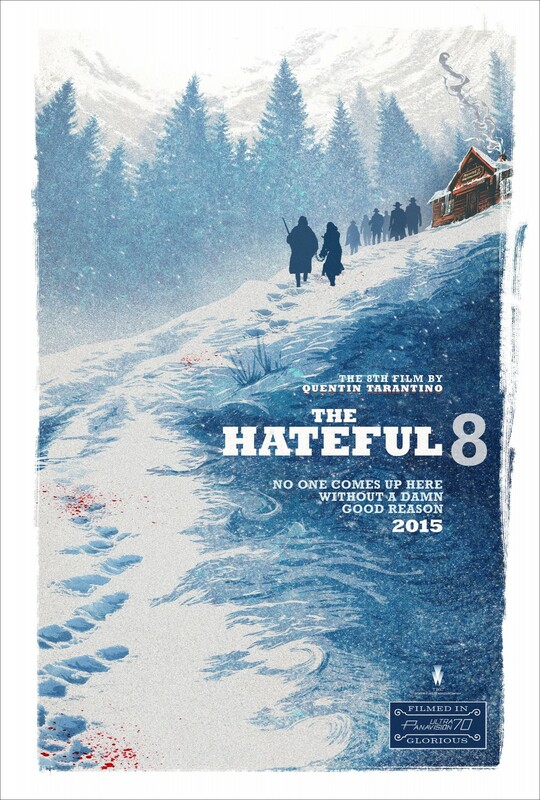 The Hateful Eight is hands down, Quentin Tarantino’s darkest movie to date. The characters aren’t likable, the violence is unsettling, the ending is bleak and the sense of humor Tarantino is usually known for takes a back seat to conversations that range from intense to grotesque. And honestly, this is what makes The Hateful Eight one of his best films yet. In The Hateful Eight, John Ruth (Kurt Russell) is a bounty hunter bringing a wild woman named Daisy Domergue (Jennifer Jason Leigh) to hang in the town of Red Rock in a post-Civil War America. On their travels by horse carriage, they pick up two hitchhikers trying to escape the heavy snow. The first person who tags along is Major Marquis Warren (Samuel L. Jackson), another bounty hunter as well as a killer of hundreds of confederates during the civil war. The second person they pick up is Chris Mannix (Walton Goggins), the youngest son of a famous confederate soldier claiming to be the new sheriff of Red Rock. As you can expect, Mannix and Warren instantly begin to verbally attack each other. The weather forces the four of them to stop at Minnie’s Haberdashery until the snow ends. There they meet several odd characters including a quiet cowboy named Joe (Michael Madsen), an English hangman named Oswaldo (Tim Roth), an old confederate general named Smithers (Bruce Dern) and a mysterious Mexican named Bob (Demián Bichir). Though all seems as well as it can be at first, the night quickly takes a turn for the worst and it seems like at least one of these people isn’t telling the truth. The film is split up into two parts. In the first part, we get this long build up where the characters are introduced and meet in the cabin. In the second part, things immediately go crazy for lack of a better term and everything ends in bloody madness. The story works almost identical to a stage play for most of the film. Most of the movie takes place in these very confined spaces whether it’s in a tiny horse carriage or in the cabin which all eight main characters end up trapped in. Much of the explosive action you saw in previous Tarantino films like Kill Bill or Django Unchained is replaced with long, drawn out moments of these characters talking. In fact, for the first part, there is little to no violence. This sounds boring, but the way the story is set up and the way its shot produces maybe the most intense film Tarantino has ever made. The character building in this film is incredible. Something unique about this movie is just how terrible the people are in this film. Usually in a Tarantino film, you’ll have at least one person who’s either an anti-hero or a decent person. All eight of the supposed hateful eight in this movie are shown to be despicable human beings who you wouldn’t want to spend any time with. Even the people who turn out to the “heroes” at the end of this film are extremely flawed and either racist, misogynistic, just straight up sadistic or even a little bit of both. Even the people you think you like turn out to be monsters by the second part. The humor and quick wit Tarantino is usually known for isn’t in the foreground here and is replaced with honest discussions of race and justice or dark, winter scenery set to foreboding music by master composer Ennio Morricone. A wonderful moment between Mannix and Warren in the horse carriage forces the audience to note the horrors that happened to both sides during the civil war. There’s something much more quiet and slow about the conversations and the pacing in this movie that makes it haunting. The cinematography, music and performances gave me this sinking feeling inside where I could tell that everything was leading to something that was going to be terrifying and tragic. Tarantino creates these fascinating people who in any other film would be the lead villain. It’s not hard to see the characters of Smithers or Mannix as the type of people Django would’ve had to kill in his story. But the genius part is that he takes these savage human beings and he puts them all together into this small area. And then we just wait for the tension to build and build until it reaches the point of bloodshed. If the first part is suspenseful build up, the second part is a nightmarish pay off that turns Minnie’s Haberdashery into hell. Almost instantly, everything you trust and hold on to in the first act explodes and the story goes from 0 to 100. One by one, the characters you explored for so long get picked off one by one in gruesome fashion until there’s close to nobody left alive. The violence in Tarantino’s films is notable but you’ve never seen gore to the extent it’s shown here. The deaths in this movie are stomach churning, grotesque and graphic. There’s one scene in particular involving a pot of coffee that will keep me from drinking the stuff for a long time. The ending to the movie is far from cheerful and even the moment where the heroes win feels far from happy or pleasant. The first act is long, intense build up and the finale is a quick, terrifying conclusion that leaves only a flicker of hope for humanity. The Hateful Eight is a dark, gritty epic that leaves you feeling shaken. But what’s masterful about this movie and what for me ultimately makes this one of his best films is the quiet, beautiful moments that are here as well. 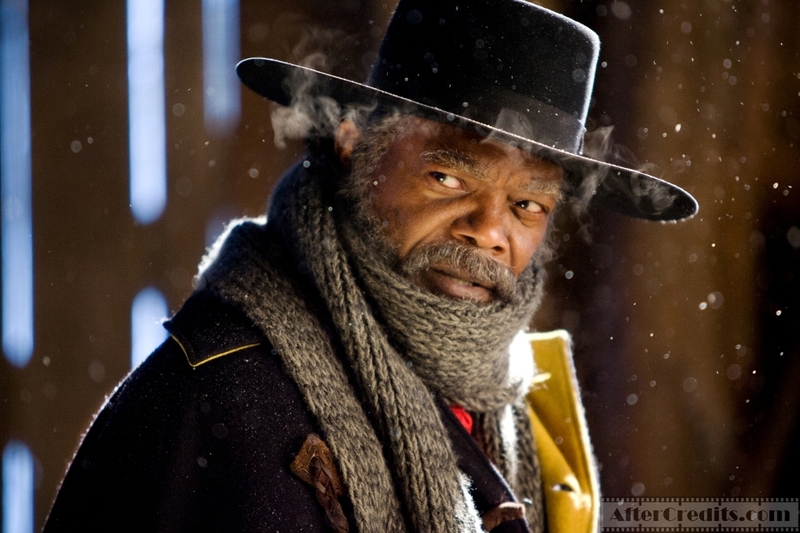 Don’t get me wrong, this is a film filled with mean spirited, grimy moments, but The Hateful Eight is also about the search for some sign of truth or connection in the face of destruction. All the characters from the proper Englishmen to the old, confederate general could be seen as signs of an era that’s on the verge of death. The cool, John Wayne inspired cowboys and the killers and thugs of a time that’s about to end. The long, bloody night at Minnie’s Haberdashery is a symbol of the end of a moment in time and all the artifacts are going to go up in flames. These people hate each other, will do terrible things to each other but in some way you get the feeling that all of these characters know that they’re facing oblivion. When everything is about to fall apart, Daisy sings a quiet, lovely song to her captor. When they face something that could kill them all, Bob and Joe give each other a sympathetic hug. The dialogue, the behavior, the music comes off as apocalyptic and this feeling of the end leads to some moments of wicked fates but it also leads to some moments of surprising compassion. But to almost completely spoil the movie for you, the greatest relationship in the movie comes down to Warren and Mannix. Both of these men in one way or another have something to do with the deaths of hundreds during the Civil War. They are unapologetically proud of the things they have done and they wear there racism on a badge. If two people are bound to kill each other on that frightful stormy night, it’s certainly going to be these two. And yet, like Butch and Marsellus in Pulp Fiction, these two men are faced with a shocking, unexpected moment and they’re forced to work together to stay alive. Both men are beyond redemption but the face of death forces these two opposites to form a bond of friendship that’s stronger than race, politics or religion. And while the ending is certainly the definition of bittersweet, you feel oddly at peace with how the movie ends. The events of that night will never be understood and everyone in that room will eventually be forgotten. Everything they fought for will be lost and all that lived and breathed in that small room will be small in the grand scheme of things. But on that night, when it all fell apart for the cowboys, Mexicans, warriors, monsters, gentlemen, Yankees, and Confederates; it all ended on a brief glimmer of light. Two wildly different souls acknowledge the absurdity of everything that has happened to them before getting washed away like everything else in that frosty, chilly cabin. The Hateful Eight is about ugliness and horror but in some way it’s also about finding something worth savaging in all of it. The Hateful Eight is one of the best films of 2015 and it’s yet another classic to add to Tarantino’s list. There’s so much about this movie that I loved that I didn’t even get to discuss here. Jennifer Jason Leigh, Samuel L. Jackson and Walton Goggins all give performances that deserve awards attention. Jennifer Jason Leigh in particular plays easily the best villain of last year in a role that’s equal parts compelling and frightening. As I hinted, the cinematography is perfection and you should see this film on the largest screen you can. Ennio Morricone’s music for this film is brilliant and it sets the tone for this movie in a way that’s unlike any other film I’ve seen from Tarantino ever. The Hateful Eight is a perfectly directed, perfectly written, perfectly acted ride through the pits of hell. It’s a sad, atmospheric, bleak epic that managed to keep my absolute, undivided attention for all three hours. If it makes any sense, ugliness has never felt more beautiful than in this movie.